Bulk sms software is fully capable to sends unlimited number of personalized and localized text messages all over the world from user’s computer PCs to any mobile phones in a single click. Facilitate to send SMS from PC to other mobile phones via using windows based Pocket PC and PDA mobile phones to send sms nationally or internationally. Users effectively sends (season greetings, job alerts, event alerts and notifications, promotional campaign, contracting employees, invitations) messages to their relatives, friends and office employees from PCs to mobile phones connected via Microsoft ActiveSync and windows mobile device center technology. Please remember If your PC is running Windows Vista, your synchronization settings will be managed through the Windows Mobile Device Center. If your PC is running Windows XP, or earlier versions, your synchronization settings will be managed through Microsoft ActiveSync. Sends bulk of sms from Desktop PCs, to any other mobile cell phones via Pocket PCs and PDA mobile devices. No internet connection is required to send the text messages. Software sends messages in any language with support to any mobile network. Do not require any expertise knowledge to operate the bulk SMS software. Quickly and easily software is supported by windows XP (home, professional and media center), windows 2000, windows 2003, windows NT, windows ME, windows 98 and windows VISTA operating system. Pocket PC to mobile SMS software effectively sends globally bulk of local or personal sms that includes (season greetings, job alerts, event alerts and notifications, promotional campaign, contracting employees, invitations) from windows Pocket PC and PDA mobile device to any other mobile phones in just one click. Support Smart phones or Pocket PC mobile phones use to send sms includes HP iPAQ h6300, HTC MteoR Smartphone, HTC TyTN Pocket PC phone, HTC Universal reference platform, HTC Wizard and Apache reference platforms, HTC Blue Angel and Harrier reference platforms, HTC Typhoon reference platform, HTC Amadeus reference platform, HTC Magician reference platform, i-mate PDAL and JAQ3, i-mate Smartflip, i-mate JasJar, i-mate JAM, IzenMobile KRMA and KSMT etc. Software sends unlimited number of text messages from Pocket PC or PDA mobile device to other mobile phone all over the world. Provide extraordinary messaging facility for business travelers or other organizations. Does not require internet connectivity to send the sms! Support GUI interface to send sms in any language. Non technical user can easily operate the software. Easily run under the windows 98, 2000, 2003, XP, NT, ME and VISTA operating system. 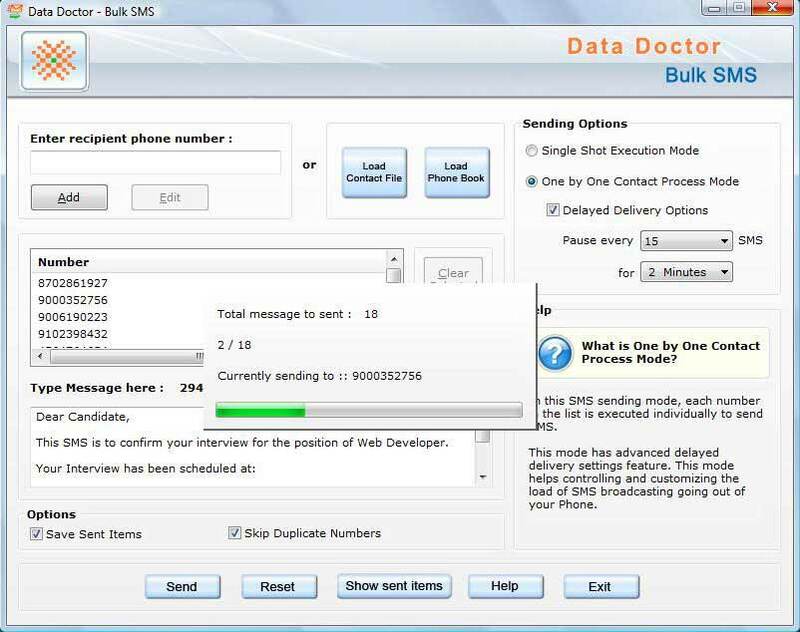 Data Doctor facilitates you PC and Pocket PC mobile messaging software bundle that includes (Mobile SMS software and Pocket PC to mobile SMS software). Software Runs from your Personal Computer using your Windows based Pocket PC, PDA Mobile Phone Device to send text messages (SMS) in just single click. Software Runs from your Windows based Pocket PC, PDA Mobile Device and provides facility to send Mobile text messages (SMS) from anywhere with extraordinary messaging features. Great money saver package includes Pocket PC Mobile text messaging software and PC to Mobile text messaging software to send text messages.